I recently went to a makeup counter at the mall to buy some new foundation. I was at the counter testing some foundation colors when I saw at the corner of my eye one of the makeup sales person applying lipstick from the testers on display. I continued looking and saw that she didn't even clean the tester and put it straight back on the counter. I remember when I was a sales rep at the various brands that I used to work for, that was a big no-no! Hygiene is a crucial element at makeup counters since it is an easy target for all sorts of germs to spread easily from one person to the next. Here is how to protect yourself from pink eye, lip sores, and other dangerous viruses that can be passed on at makeup counters. 1) Need to test a pencil eyeliner or lipliner? Ask for a sharper and sharpen the pencil. Sharpen the pencil until you get to a fresh, new, untouch area. Sharpen again after use and return to the display counter. 2) Need to test a lipstick, gloss, or lip stain? Ask for a tissue paper and a throw away lip applicator. Use the tissue paper to wipe off the first layer and using the throw away lip applicator, dab some lipstick on the lip applicator and use the lip applicator on your lips. Wipe lipstick again and return to the display counter. 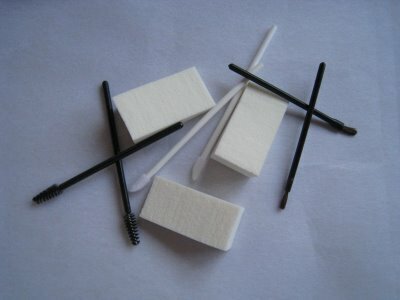 3) Need to use a makeup brush? Ask for a makeup brush cleaner spray. Spray a few times on the brush and wipe it with a tissue. Once you have finished using the brush, spray the brush once more. Wipe and return. 4) Need to use a mascara? Ask for a throw away mascara wand. It is easy to protect not only yourself, but also others from dangerous baterica that can be passed around. Unfortunately those at makeup counters are the ones that really need to implenment these rules until others can follow. Don't assume anything is clean unless you cleaned it yourself.